However, due to a report closing in and I have troubles using libreoffice I installed win10 back. 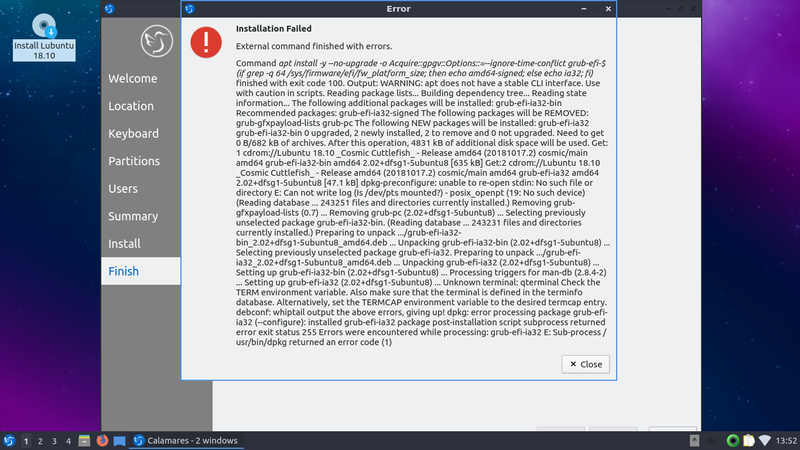 Now I want to go back to Lubuntu but at the end of installation there's a window pop up with message as follows: External command finished with errors. Error message pic Since I don't have any background on computer science or anything like that, I can only assume that bootia32.efi somehow didn't work as planned (Correct me if I'm wrong), but when I installed Lubuntu for the first time this didn't happend. So here I am, looking for any suggestions and advice. If I can't fix this I'll just have to back to win10, but I've just made up my mind trying out linux during my two-week vacation. Your words mean a lot to me, thanks! Browse other questions tagged system-installation lubuntu or ask your own question.